Anything look out of place in this photo? 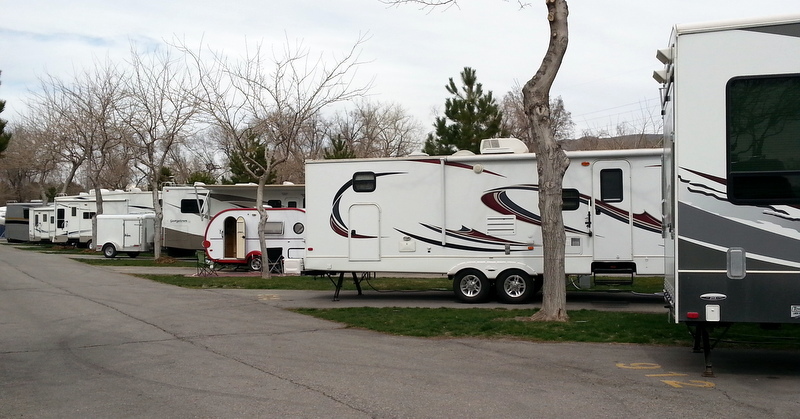 Urban Camping at the Salt Lake City KOA! We’re the only ones with a tablecloth on our picnic table, and the only ones with two mis-matched lawn chairs, and the only ones with a doormat. But, we are loving the location – right on the train line to downtown, and bicycle lanes everywhere. WiFi – oh yeah. Throw in a warm shower after a week of dry camping, and this looks pretty good. We’ve played tourist here for a couple of days. 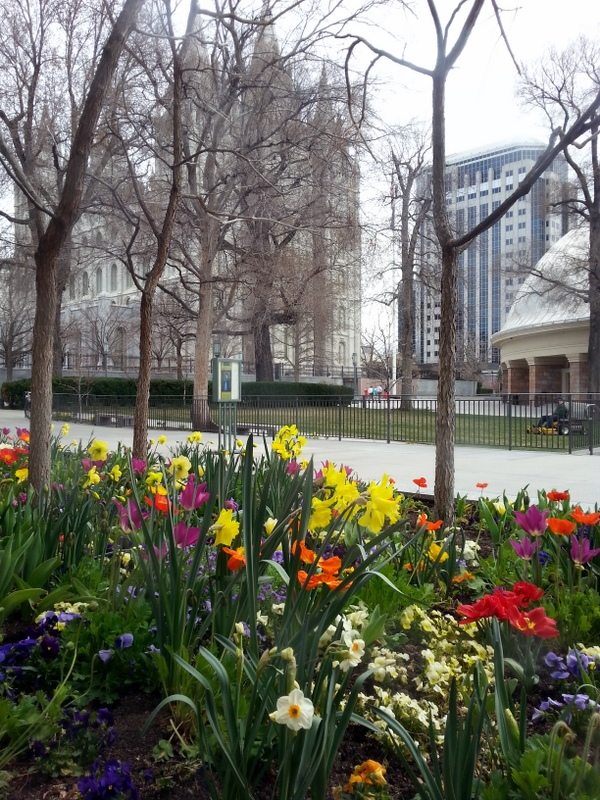 SLC is beautiful – surrounded by lots of snowy mountains, although it’s bright and warm (low 60s). Day 1, the priority for me it to get a haircut – jamming my head in a baseball camp just isn’t going to cut it anymore. Having strangers cut my hair is scary, but this one turned out great. Whew! Good for another six weeks. While I was occupied with that, John parked himself in a great little coffee shop and plotted our bicycle tour. Here we go. 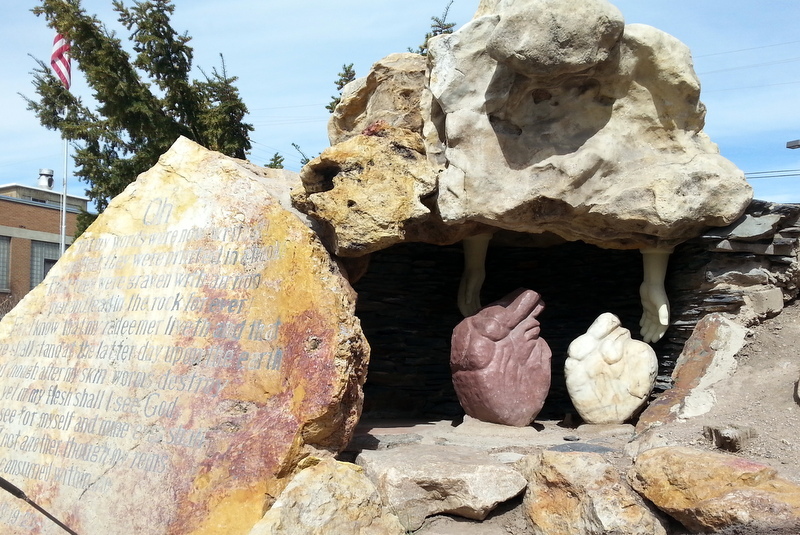 Stop 1 was Gilgal Gardens. 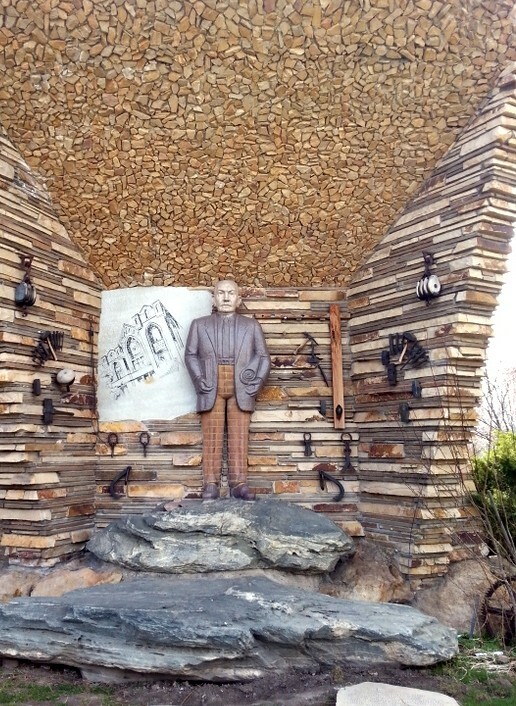 This unusual sculpture park is tucked away in a residential neighborhood. 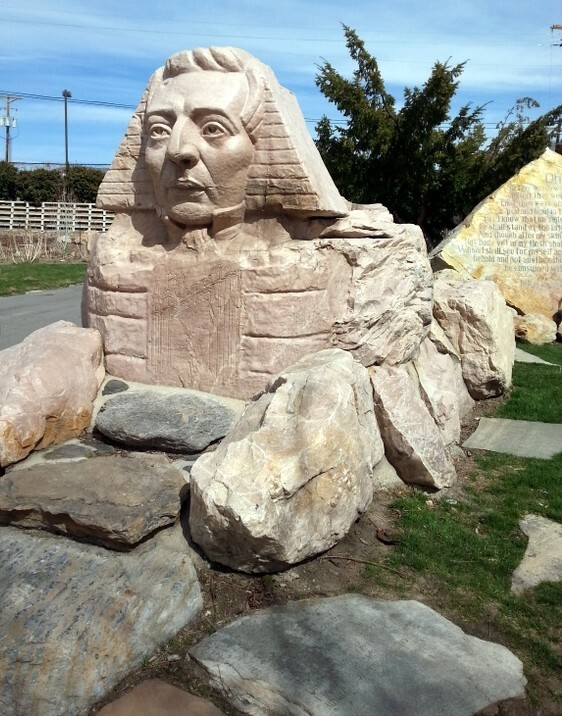 Features the head of Joseph Smith on a sphinx, and another statue we believe to be Brigham Young. Hands coming down from the sky….not sure what it was all about, but interesting. 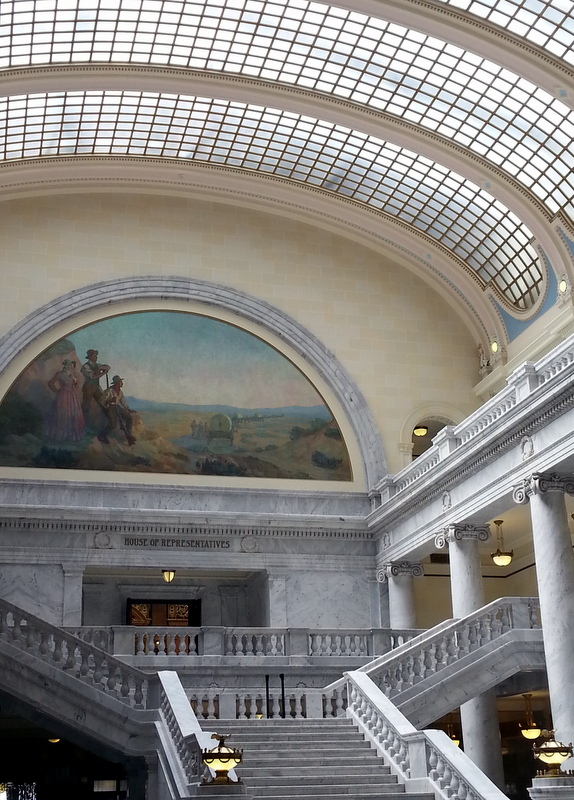 Next stop is the City/County Building, and the Library. A wonderful contrast of old and new. We were here at a good time to see the former – next year it will be covered with scaffolding while the outside is treated to try to slow the crumbling of the limestone facade. 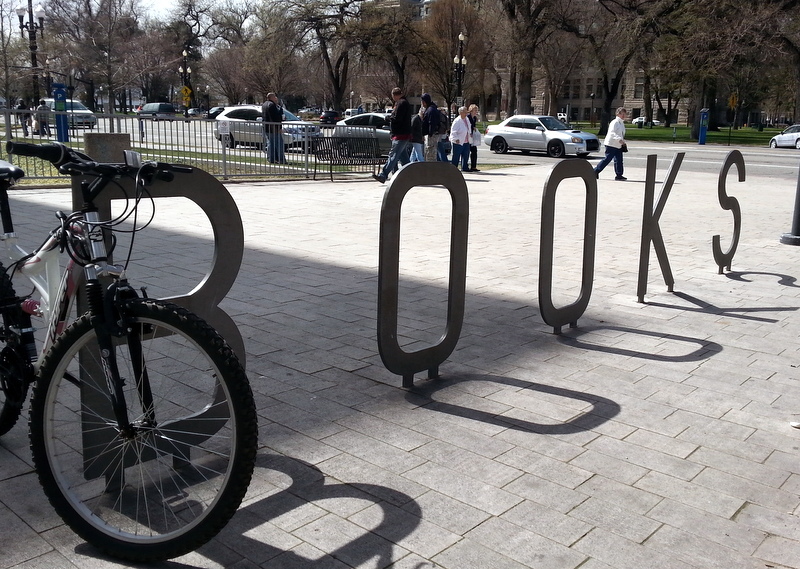 The Library has the best bicycle rack ever! Two big words READ BOOKS – individual letters planted in the ground. 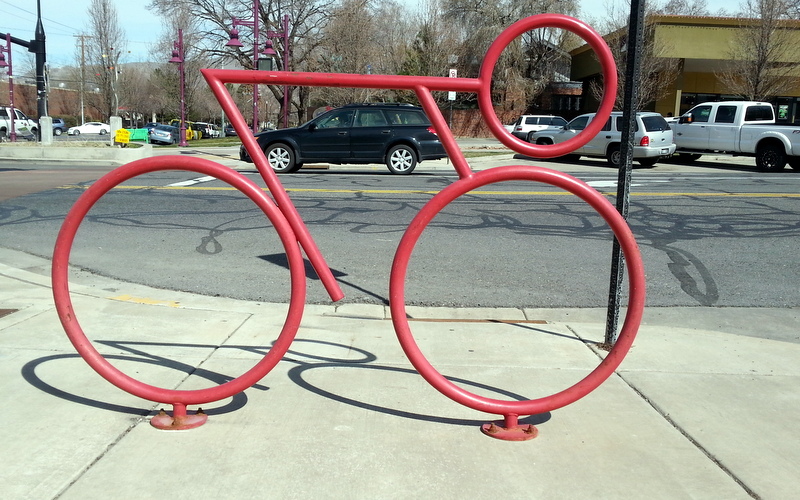 The rest of the bike racks in the city look like this. Great. 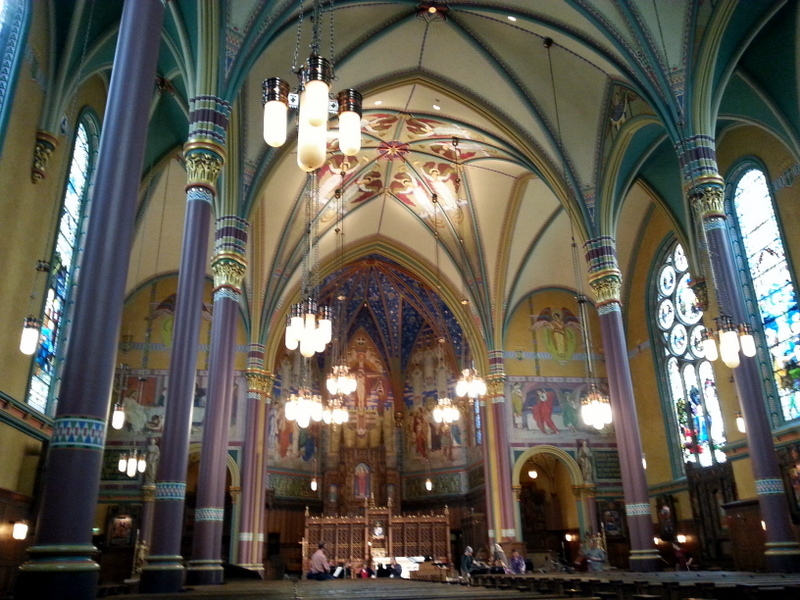 Next stop was the Cathedral of the Madeleine. 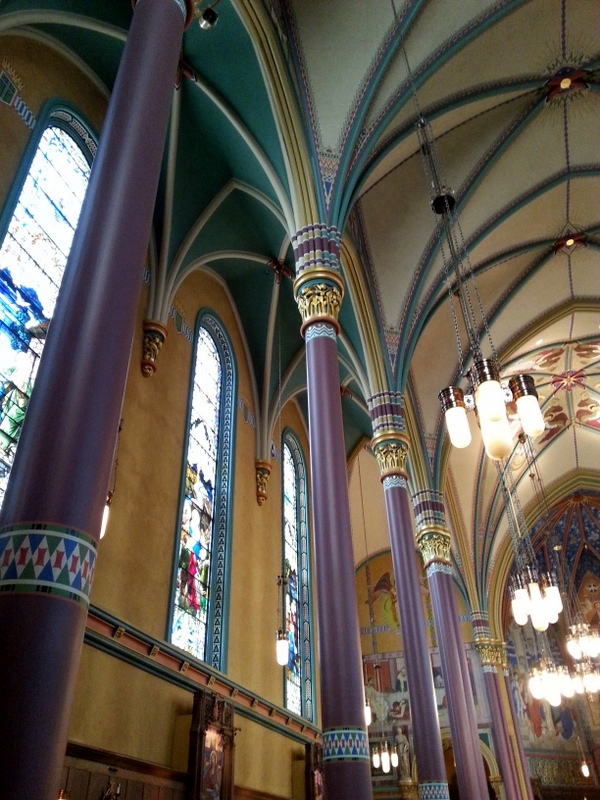 Easter egg colors throughout the interior were striking. We snickered about the idea that the Mormons have the town center corralled, but the Catholics have their cathedral on a bit of a hill, so that it overlooks the Temple and all the other LDS buildings. On purpose? One step closer to heaven? 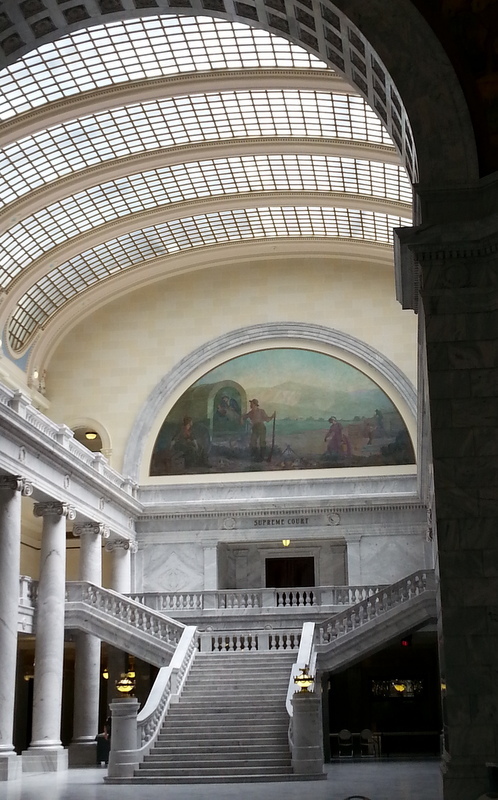 Onward to the State Capitol building, which sits even higher up the hill. We were really huffing and puffing by the time we got there. Unbelievably lavish. Utah must have been rolling in money when this was constructed. 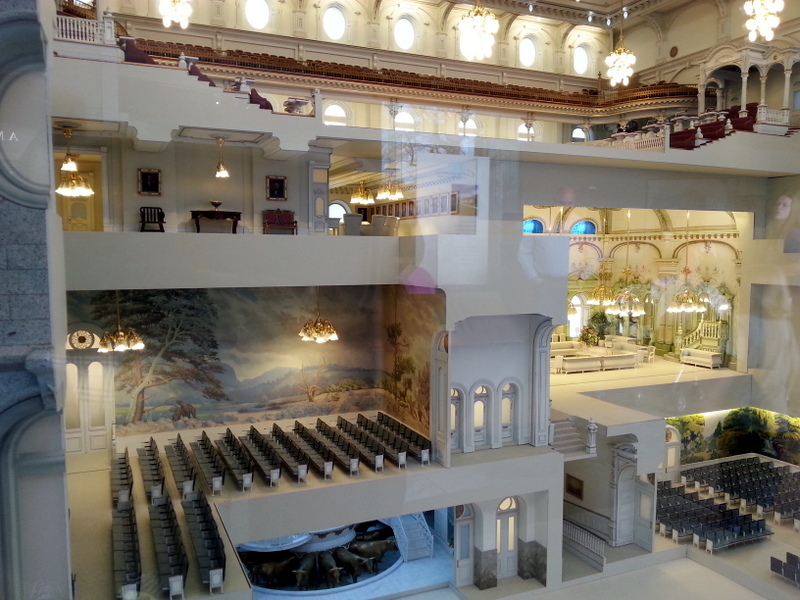 We’ve not been in many State houses, but surely this must be one of the most elaborate. Wonder if there’s a ranking somewhere. Apparently, the government was not in session on this Friday, because it was absolutely devoid of activity. Okay, now we’re ready to tackle Temple Square. 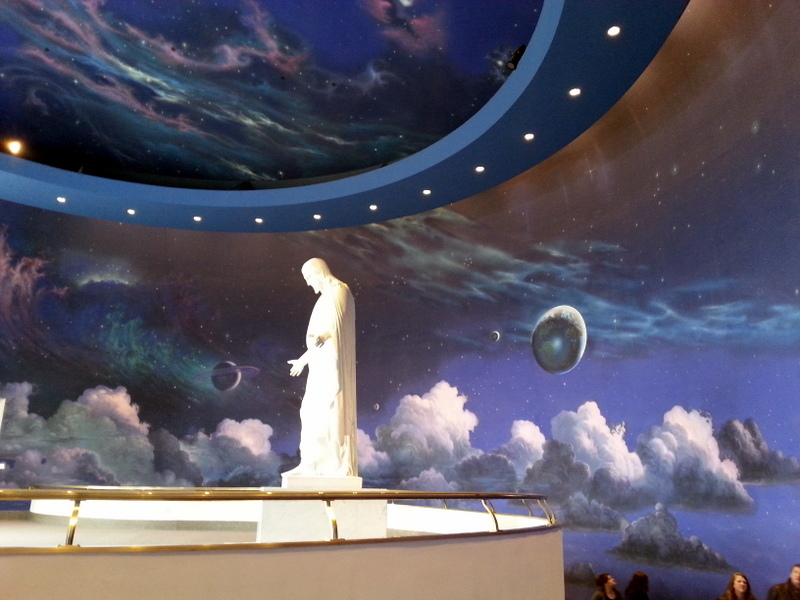 As non-Mormons, we’re not allowed to enter the Temple, but we did go to the Tabernacle, and both Visitor Centers. Lots of people with lanyards and big smiles, greeting us at every step of the way. Everyone is white. Spring flowers have popped up, and it is gorgeous. 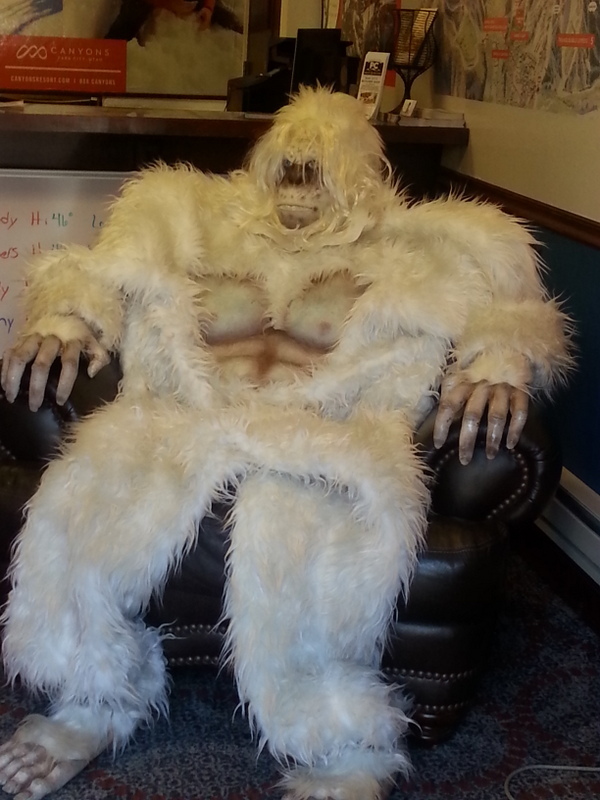 We tried not to make eye contact with anyone. No kool-aid, thanks. All in all, a pretty brief tour, but you get the idea. 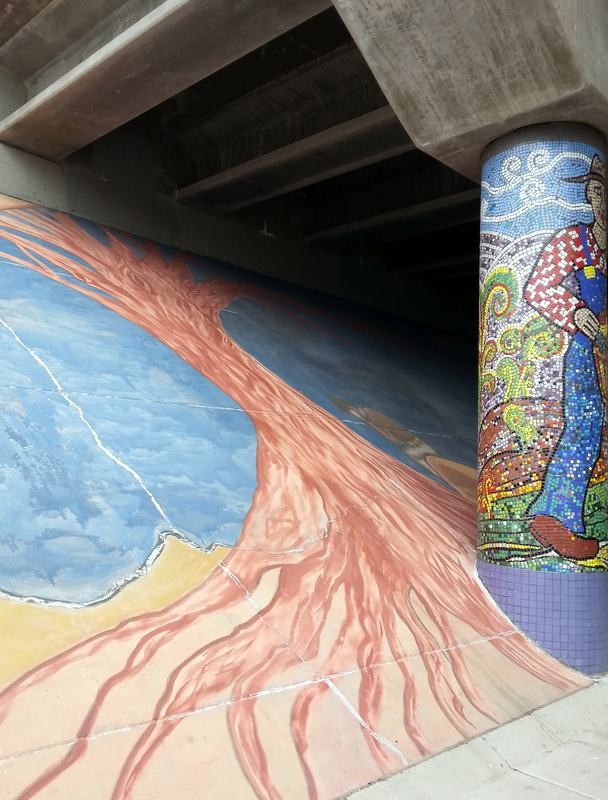 We cycled back home, passing under these pillars beneath I-15. Saturday, we decided to drive to Park City to see how the other half live. This ritzy ski town hosted many events for the 2002 Olympics, and is also the center of the Sundance Film Festival. But, there still are a few things that made us laugh. We’re headed off today to our roots – camping in the dirt. Destination – Antelope State Park, located on an island in the middle of the Great Salt Lake. Should be fun. 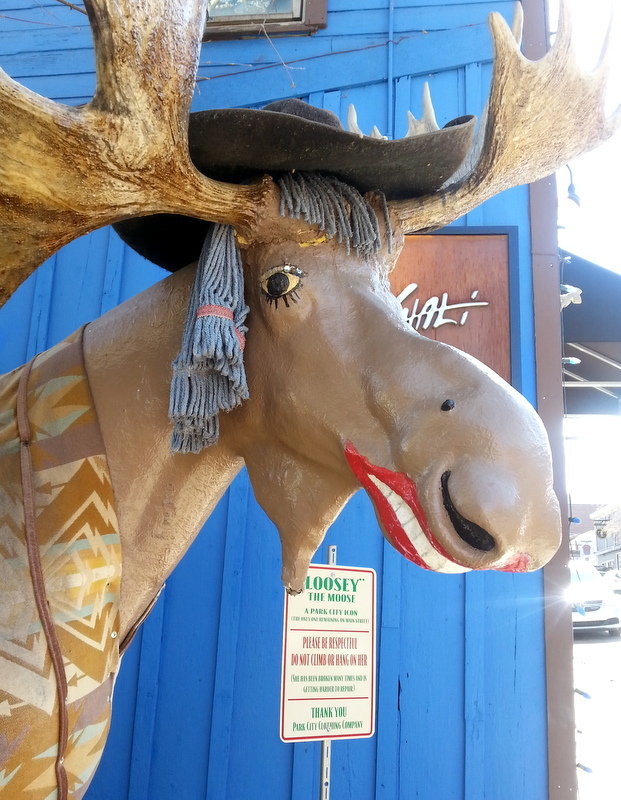 This entry was posted in camping, cycling, retirement, RV life, simple camping, T@DA, Utah and tagged camping, cycling, historic sites, retirement, road trip, simple camping, T@DA, Utah by Judy Crankshaw. Bookmark the permalink. We tried to camp at Antelope many years ago but a neon, flashing sign warned us that the bugs were bad! We left after the ranger told us that the bugs were also biting! Hope it is way too early for those varmints to be out Have fun. It’s an incredible time to camp. New post to follow soon. Too early for bugs. Just birds, bison, antelope, jackrabbits, one coyote, and us. I’m really digging that tour….learning so much! What fun…. It is fun going new places, and earmarking spots for return visits. We’ve had such good luck weatherwise, which is a huge bonus. Santa Baby!! Love the name. While I (secretly, or perhaps not so secretly) lust for an Airstream, I really can’t imagine not having the T@DA. It really works well for us. Can’t wait for the full tour of your new home at the BRR. Are you going to leisurely wander there, or take the express route? Your architectural photography is where your skills shine best to me. I loved gawking along! Gawk away. Happy to oblige. Thanks. Thanks, Jochen. Touring on a tandem as you did must have been difficult. This is not the easiest terrain to ride, as you well know. Crossing the mountains on a loaded tandem is no task for sissies! We will probably pass on that opportunity. Take care. 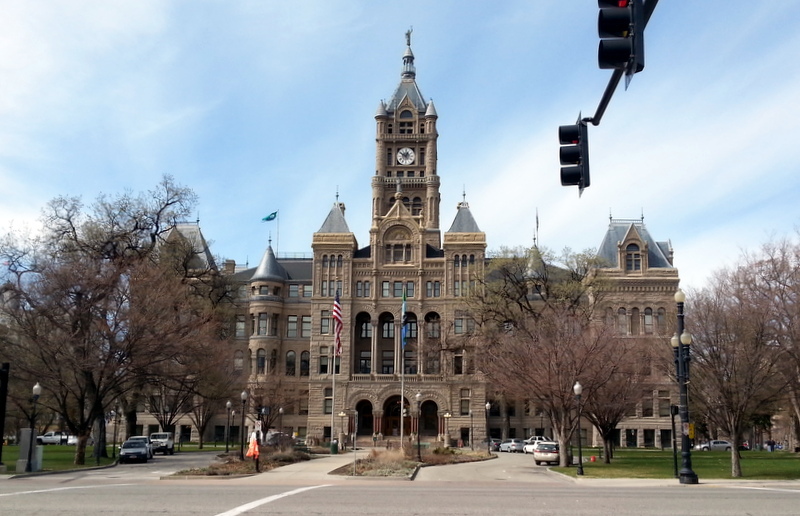 Salt Lake City is a beautiful city, and I don’t think that many of the buildings cost as much as you would think that they did, since they were a labor of love with a lot of donated craftsmanship if I remember correctly. I can tell one thing from following your blog, I’m going to have to get a bicycle to use to get around one of these days. A big pannier on the rear for your camera gear, and you will be good to go anywhere. After a bit, it becomes your standard MO. You will love the versatility it gives you. Re: cost…..the one room in photo was called The Gold Room. Real? Don’t know. One hell of a donation, or cost, in any case. There were signs in a few places about donations for restoration. In any case, it’s spectacular. 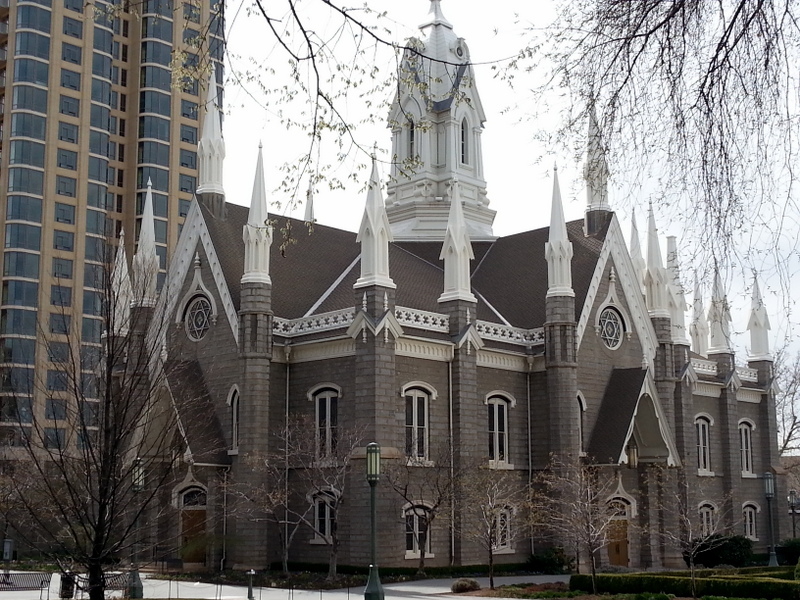 In Temple Square, the Assembly Hall ( dark church like building w/steeples) was built with leftover materials from the Temple. The entire scene is beautiful. Were you able to hear the sound demonstration at the Tabernacle. That was a highlight of my visit when I was still doing music. 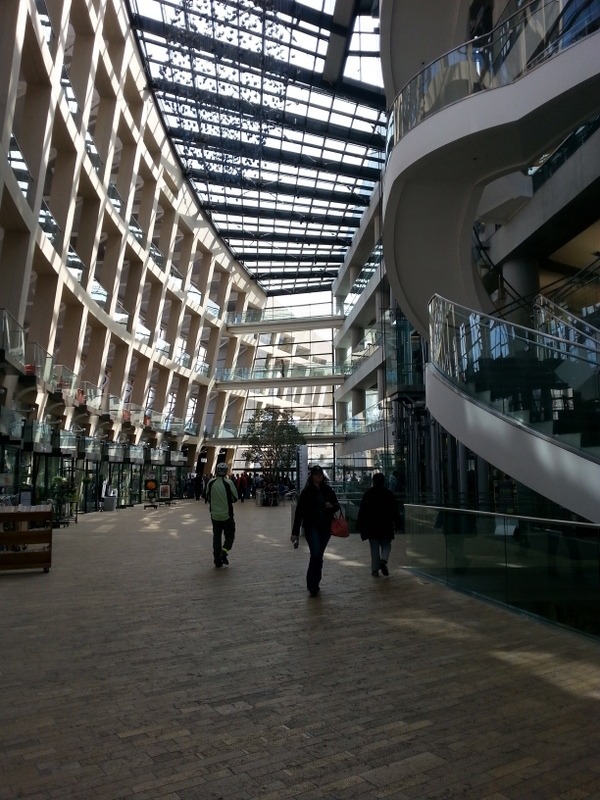 Such an amazing feat of engineering – nothing but wooden pegs – no nails, and such perfect sound conduction that you can hear a pin drop from the front of the building to the back without a microphone. Did you get your free Bible or Book of Mormon? Be sure you visit the Great Salt Lake. Both times I was there the whole desert was flooded from SLC to the Nevada border. The highway is built many feet above the desert floor to accommodate the floods from mountain run off. It’s probably too cold to swim in the lake but that was another amazing experience. Even this lead weight could float. We were in the Tabernacle, but not at sound demo time. Too bad, cuz that would especially have been up John’s alley. We were a bit surprised to see a bank of speakers hanging from the ceiling. We are now camping at Antelope Island, right in the middle of Salt Lake. Amazing. No cold swimming for this girl though….had my fill of that @ Zion!